I cut my stamp from fun foam (or at least I think it's what you call it in English, although I'm not sure how fun it is) and stamped with acrylic paints mixed with wheat paste. That white looking color is actually metallic champagne, and the magenta and phthalo green paints are slightly metallic, too. Browns are what they are. 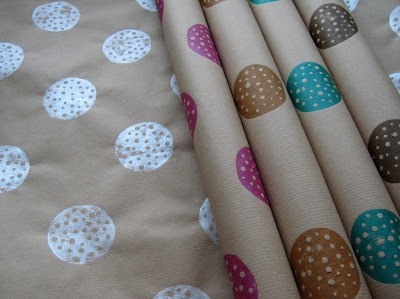 And the paper is just plain brown wrapping paper bought from the post office. I've already cut another stamp but I still need to glue it together. And stamp! A beautiful morning turned into a beautiful day. I started my morning by taking pictures of yesterday's creation and feeling happy about not having a tummy ache anymore. Obviously I haven't learned anything since last year, as there clearly is a limit to how many mince pies (or joulutorttu) one should eat. This one will be for sale in Paperiaarre Etsy shop later today. 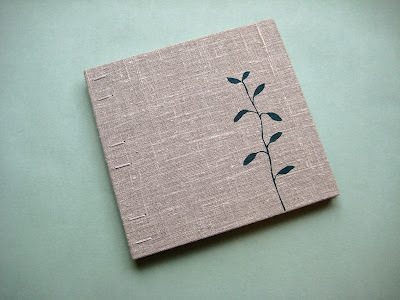 The large guest book from yesterday's blog entry is already in there, too! Despite of feeling even more ill today I went for a little trip to the city and couldn't leave these crows alone once I spotted them. 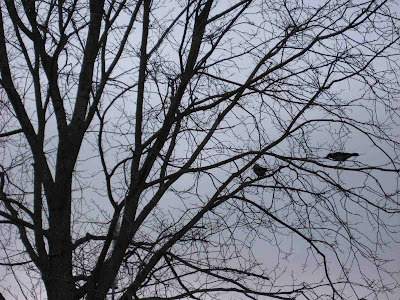 As if it were somehow hard to spot crows... they seem to be everywhere. I did finish a book yesterday! 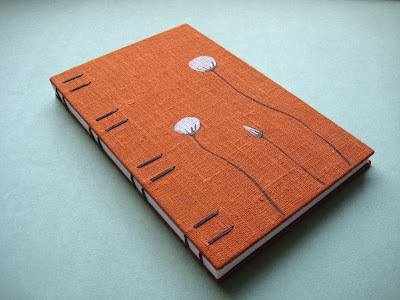 This is a slightly larger book, that would work great as a guest book or journal. I'm having trouble with making new, larger stencils, so for now I'm using the ones I already have. I'm good at making small new stencils, but whenever I need something bigger I'm completely lost. That's one of the reasons why my books are usually quite small. Another reason is shipping costs. How boring. I'll make some gigantic books once I've got a studio of my own and a lot of money. 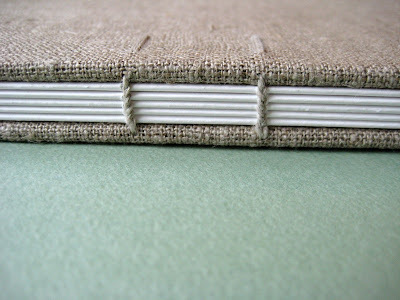 Coptic bound guest book / journal: 9"x8.5"0,6" (22,8x21,7x1,6cm), 80 white pages with a slight watermark texture. 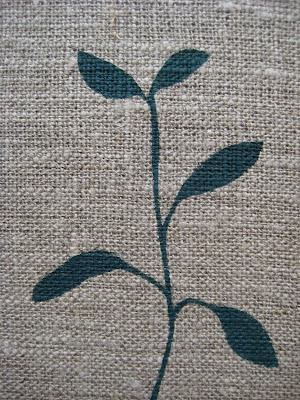 Covered with dark natural linen, pastedowns on the reverse side of covers are lovely light robin's egg blue, which matches great with the deep green on the cover. As always, stenciled with acrylic paint, hand-cut stencil. My flu is very persistent and it's gotten worse for a change. I'm surprised if I get well before next year. I hope that the future brings less bad hair days and more outdoorsy days. But for now, I settle with what I've got and make more books since I'm not going to step out the door on a day like this. Every night when going to bed I think, tomorrow I'll make some books. And I end up making brooches, necklaces, stationery, foxes and stamps for decorating wrapping paper. 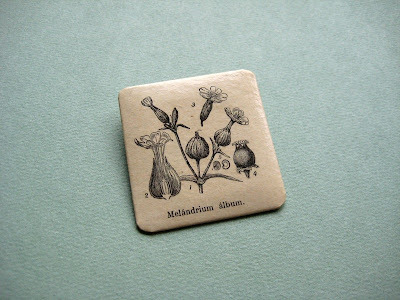 Well, today I listed a small part of all the new botanical brooches and necklaces I've finished this week. I will be listing more in near future, too. But for a while, I'll try to focus on making only books. Yesterday was a nice day to go to the Christmas market. We didn't find anything to buy from there, but I bought a nice little white and brown kamusi linen purse. Kamusi could be translated as your buddy or your friend. Of course I forgot to take a picture while there was still light, but maybe some other day... 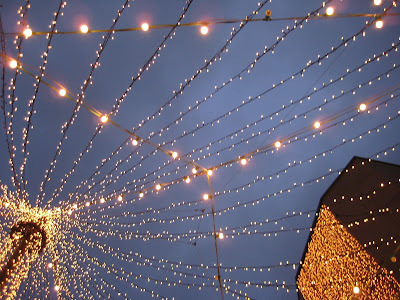 Instead of purse photos, some festive lighting above the pedestrian street in the city center. (And yes, it's the pedestrian street.) Yesterday was a good but very tiring day. 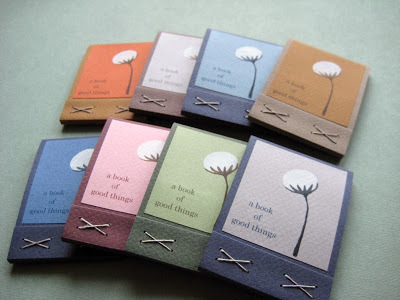 Books of good things in the shop! Well, they're finally here! I currently have them in eight different colors, but more colors and new combinations will be listed to Paperiaarre Etsy shop sooner or later. Tomorrow is the independence day and we're having sleepover guests. That means I've got some cleaning to do! My workshop isn't the tidiest one.